Students leave pennies (as well as assorted bills, gift cards, and other trinkets) at the base of Sully for good luck before taking their exams. The items are collected each semester and donated to a local charitable organization. 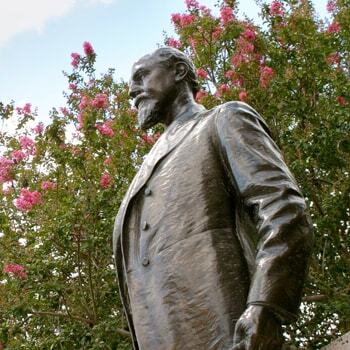 Dedicated in 1918, Sul Ross is the oldest sculpture on campus. One of my favorite memories of my freshman year of college was going to put a penny of Sully for my last final of the year. When I got there, I found a representation of Kyle Field made completely out of pennies. I don’t know if that architect even studied, but with all the good luck he accumulated, I’m sure he did just fine.